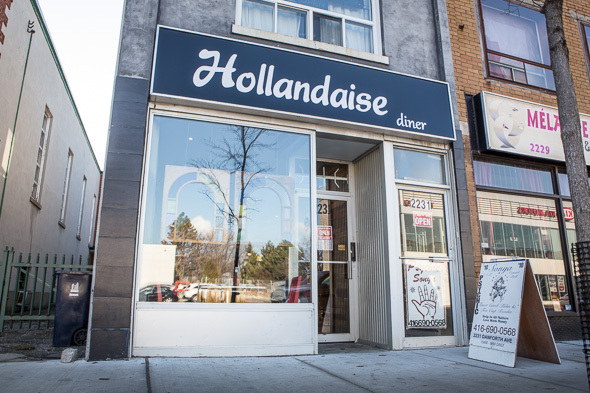 Hollandaise Diner is exactly what this stretch of the Danforth needed. 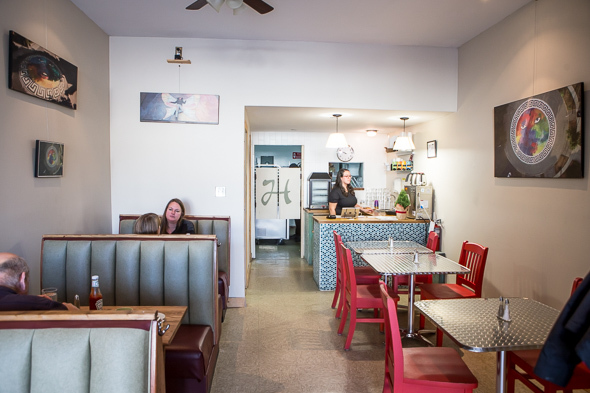 The daytime destination is all about all day breakfasts, and the menu checks all the boxes for every imaginable a.m. craving, complete with a host of eponymous sauces to accompany the eggs. 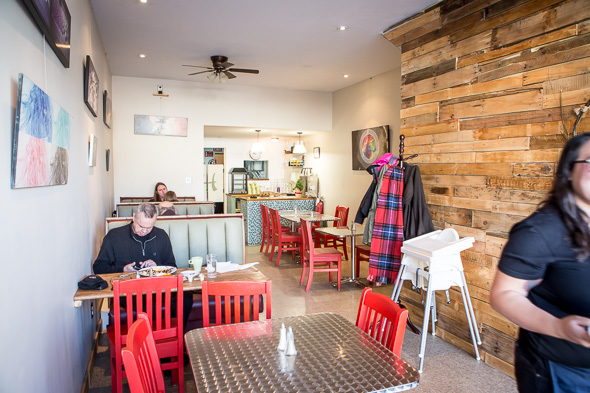 The restaurant from David Suckling and Josh de Grosbois is ultra casual, furnished with a couple of booths but mostly bright red chairs at stainless steel tables. High chairs and booster seats are in no short supply. The coffee is drip and bottomless. 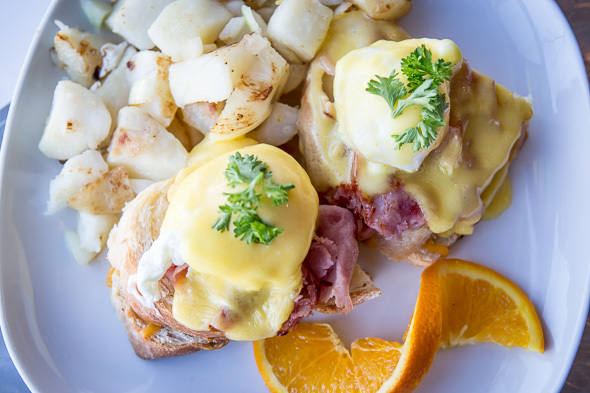 The menu covers all the bases; there's classic bacon and egg plates, frittatas, customizable pancakes and, of course, a multitude of hollandaise-smothered riffs on Eggs Benedict including a build-your-own option. Fluffy pancakes ($8.85) served three at a time, come in three choices; plain, chocolate or coconut, and you're welcome to mix and match. 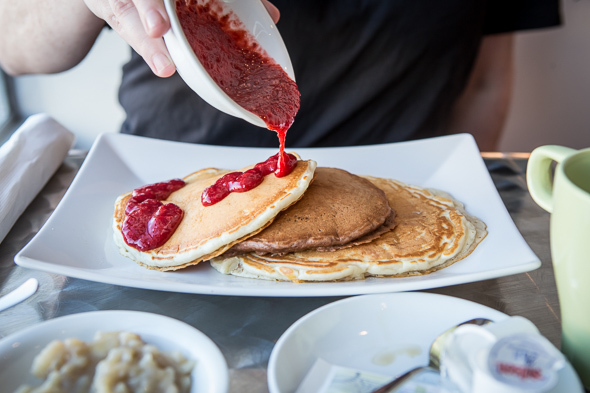 Dress 'em up with house-made sauces like strawberry, blueberry, raspberry, banana, chocolate, or maple ($1.33 after the first selection), or opt for toppings (+$1.33) like chocolate chips, toasted coconut, or bacon crumble which can be applied as a garnish or mixed into the batter. When it comes to Benedicts, there are standard varieties with peameal ($10.62) or spinach ($10.62), plus novel creations. The coconut benny ($11.95) is a carb-free option featuring poached eggs smothered in coconut hollandaise over bitter greens and tomato, while the meatloaf benny ($11.95) sees HP-infused hollandaise over eggs on ketchup-glazed meatloaf with sautĂŠed mushrooms. I try the croque madame benny ($11.95) built on a bed of crispy fried ham on a grilled cheese sandwich. The eggs are poached fresh to order and they're perfect; the silky scratch-made hollandaise sauce is on point. The accompanying home fries look a little anemic but the potatoes are soft and buttery - I only wish the onions were more caramelized. 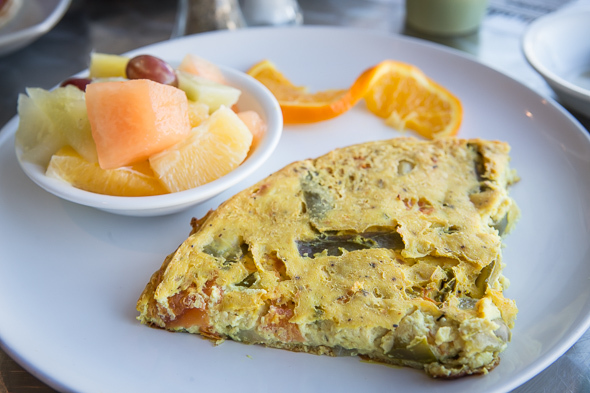 There isn't a vegan hollandaise option, but the menu can accommodate vegans with the Mighty Vegan frittata ($12.39). It's a tofu-based wedge that does a pretty good job imitating baked eggs. It's packed full of flavour thanks to a medley of spices and vegetables including asparagus, potatoes, tomatoes, peppers, onions and garlic. Expect the restaurant to open early seven days a week and wrap up service in the afternoons.